I was flipping through 8 Days when I came to the 'Shirtless Guy of the Week' section. I swear I usually skip this brainless section but what got my attention (No, no! It isn't what you think!) was that the guy was Korean and he actually, well, looked like a guy!!! (All those Korean boy band boys look like girls to me, with their snow-like skin, slender nose, non-existent waist... Sigh. I would be in a state of depression if I lived in Korea.) Anyway, I read the article and realized that this guy was discovered on PreVView! 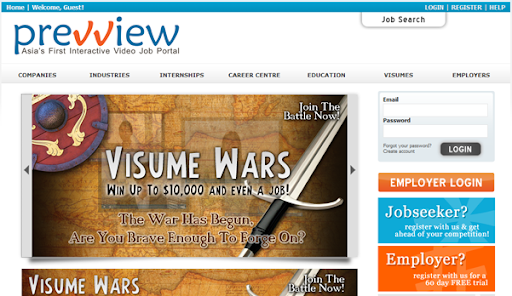 PreVView is Asia's first interactive video job portal. Started on March 9th this year, it aims to break the barrier between employers and jobseekers. No longer will the former be looking at the passport-sized you with the awkward, stiff smile. Instead, employers get to see the real you in your visumés (Video résumés)! Unlike other job portals, where you are asked to fill in a never-ending list of details, you are given the platform to stand out from the crowd, not just on paper, but in a more insightful and expressive manner on video! In this way, your first impression depends on you; the way you speak, the manner in which you present yourself, your confidence and so on. Your first impression is no longer defined by the papers you achieved. Right this minute, a Visumé War is waging! "We call upon everyone from the age of 18-35* to step into the professional battle field, in a quest to differentiate yourselves – it's talent vs talent, Visumé vs Visumé!" 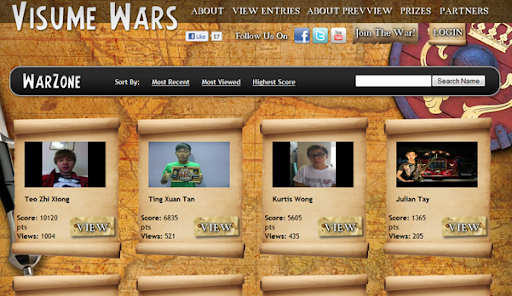 Julian Tay's video is probably the most creative out of all the videos that I have seen! Unlike quite a few who just basically sat in front of the camera and talked, he used awesome animation and graphics! Also, his video is 'flawless' in the sense that you know he really put in the effort to prepare for it (Or maybe he is just that great...). There isn't any fumbling of words, lines are delivered with confidence... He certainly stands out from the rest! 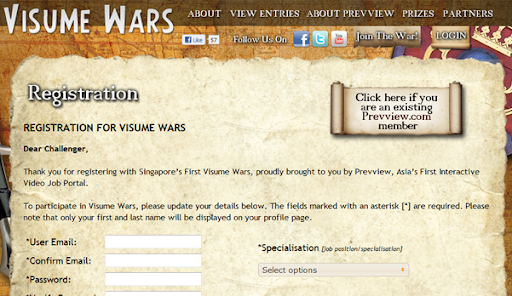 For more information about PreVView and Visumé War, click here and here!